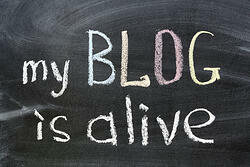 Creating and maintaining a blog in today’s internet-filled world is almost essential in attracting and keeping customers. However, maintaining a blog is easier said than done, especially when you begin including search engine-ranking factors into the mix. Lucky for you, we’ve compiled 10 simple SEO tips and tricks that you can put to use to keep your blog on the search engine radar. Take a look! A hugely important aspect of modern optimization is that you provide content that is relevant, interesting and informative. How can you do this without even knowing who’s looking at your content? By closely evaluating your personas, you will get an idea of your viewer’s wants and needs. The main goal of your blog should always be to provide those wants and answer those needs. Write posts that your personas will find interesting and helpful. Taking your analytics and competition into consideration, craft a list of keywords that will help your site rank better on search engines. We suggest going with terms that have moderate monthly searches, but a competition of .5 or lower. Writing content based off of keywords instead of vice versa is smart for creating a data-based content strategy. Efforts will become more refined and will more accurately and mathematically puzzle together. Think about the search terms that you typically post into Google. Often, you’ll find that your searches are phrased in the form of a question because you are looking for an answer. Reflect this by accommodating these forms of search – answer questions or provide solutions throughout your blog posts. By providing valuable content off the bat, you’re likely to improve your SEO results as well. Going off the premise that you should be providing answers with your posts, you should really give the authors topics that they are comfortable researching and writing about. There’s nothing worse than reading a blog post from someone who has no idea what they’re writing about. You’ll notice it right away, and will not stay on that page, ultimately creating a “bounce.” Posts don’t have to be written by experts, but ensure that posts are truly providing value to the reader. If readers are finding value, they will come back for more, and your site will slowly grow its authority – helping to make future posts higher in search engine rankings. Typically, the title of a blog post is what makes the first impression on a viewer. They say not to judge a book by its cover, but let’s face it; we do it all the time. Some of the blog title forms we’ve found to work well are, “how to,” “5 ways,” and “topic 101.” Be creative; create titles that you know will resonate with your personas. Sticking to 2-3 of these options will work best with Google’s newest updates as long as they sound natural. At this point, adding the keyword into the body copy a bunch will not help, and may even hurt your efforts if it appears suspicious to search engine crawlers. Instead, use different variations of the keyword, which may help if someone searches one of those terms instead. For example, if the keyword was “content strategy,” try using terms like, “content creation,” “inbound marketing strategy,” and “content marketing,” as they come naturally. You will find that this is simpler to accomplish than you may have thought; it is probably how you naturally compose content in the first place! We are naturally drawn to things that are visually appealing. Cater to this natural instinct by including visual assets in your posts like pictures, infographics, videos, etc. To go even further in depth, connect author tags and Google+ profiles to your posts. An author image will appear next to your results within a search results page. (See below). Based on research, viewers are more likely to click on a result that includes a photo than one that does not. Search engines crawl through your site, following links to discover any new pages. Help them along and increase your odds for higher page-crawls by linking to other pages within your text. If anything, this will create an opportunity where viewers can click to related articles, raising your site views and time-on-page. Help search engines crawl through your site by linking to other pages within your text. Sharing your content on social media can play two huge roles in improving your blog SEO. For one, your followers may not automatically check your blog every day, but maybe they check their Twitter feed. They are more likely to land on your blog if they’ve seen a Tweet than they would be by searching online. You’ve already built up a fan base that is interested in your material. Make it simple for them! To take it a step further, that person may have been so impressed with your post that they now want to tweet it themselves! As people share your links on social media, they will help to grow your reach and build links out for your site. This is especially important on Google+ (Google’s favorite social media platform). Provide social share buttons on your blog and each of your posts so that viewers can quickly and easily share your content! Last but not least, make sure to continually interact with your fan-base. Encourage conversation on your posts, and respond to any comments. By providing constant interaction, you’re keeping things interesting, and viewers will want to come back for more.